This chapter deals with the blood-group studies carried out by medical doctors Ivan Polunin and P.H.A. Sneath in Malaya in the 1950s and connects the application of this new technology to earlier ways of classifying indigenous people. 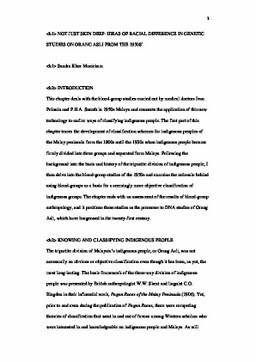 The first part of this chapter traces the development of classification schemes for indigenous peoples of the Malay Peninsula from the 1800s until the 1930s when indigenous people became firmly divided into three groups and separated from Malays. Following the background into the basis and history of the tripartite division of indigenous people, I then delve into the blood-group studies of the 1950s and examine the rationale behind using blood-groups as a basis for a seemingly more objective classification of indigenous groups. The chapter ends with an assessment of the results of blood-group anthropology, and it positions these studies as the precursor to DNA studies of Orang Asli, which have burgeoned in the twenty-first century.